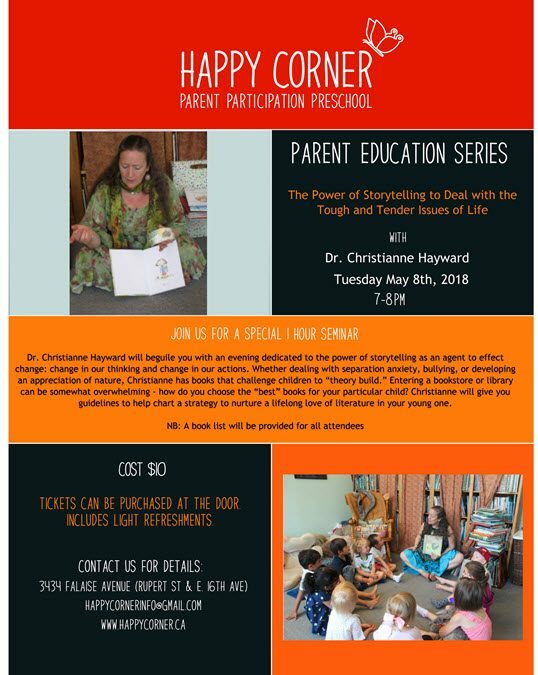 Dr. Christianne Hayward will beguile you with an evening dedicated to the power of storytelling as an agent to effect change: change in our thinking and change in our actions. Whether dealing with separation anxiety, bullying, or developing an appreciation of nature, Christianne has books that challenge children to “theory build.” Entering a bookstore or library can be somewhat overwhelming – how do you choose the “best” books for your particular child? Christianne will give you guidelines to help chart a strategy to nurture a lifelong love of literature in your young one. Tickets are $10 (includes light refreshments) and can be purchased at the door. Hope to see you there!